Horchow began is 1971, and was one of the first mail-order catalogues in the United States. Roger Horchow, from Ohio, was the main man behind the business, and it has gone on to supply homeowners with bedding, home décor and other luxury items ever since. You can shop for them online now and use Horchow coupons on Coupofy to save on your purchase. Horchow has never had its own walk-in store, and there are no plans to create any physical shops for customers to visit. The selling point of the catalogue was that customers were unable to visit the store themselves, but rather could order exactly what they wanted from the comfort of their own homes. An online store was launched in 1998 at Horchow.com, which is now one of its main drivers of sales. 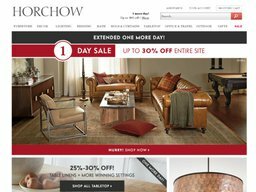 You can view all the latest items which are available from Horchow by going to Horchow.com. Their website offers a sleek and elegant design, and is easy to navigate. There are various categories to choose from, so whatever you’re looking for, it’s easy to find the right place. Categories include Bath, Bedding, Furniture, Lighting, Tabletop, Outdoors and even Gifts and Travel. Whether you’re decorating your home, looking for some new lights for the bedroom or getting a new bathroom, you can find it here. Apart from having a wide range of products available across several different categories, you can also take advantage of the Inspiration section – an area which aims to give customers new and creative ideas for their home décor. You can view different designers, take a look at customer favorites or even choose to look at some products based on free shipping features. When it comes to items for inside your home, there’s nothing you can’t buy at Horchow. For the bedroom, you can purchase lighting, bedside cabinets, mirrors, beds and rugs. The living room will look fabulous with designer settees and coffee tables, and even the television can get an upgrade with a new console. Items from designers such as Calvin Klein Home, Jamie Young and the Isabella Collection are available to buy from Horchow – perfect for adding a touch of glamor to your home. Prepare for the warm summer days by browsing the Outdoors collection and picking up a beautiful outdoor furniture set for your garden. Inviting your friends to the house for a few drinks in the sun has never been more exquisite! It’s not just the home which benefits from the Horchow items. With gifts being added regularly for upcoming occasions, such as Mother’s Day, Father’s Day and Valentine’s Day, you can rest assured that you’ll find something suitable for this online store. We all know it’s not easy keeping your home looking modern and beautiful, and it’s certainly not cheap! If you’ve seen something you like on the Horchow website, why not use a Coupofy coupon to get a great discount? With new codes constantly being added to the site, you’re bound to discover one which could save you money. Payments at Horchow.com can be made using most major credit and debit cards including American Express, VISA, Mastercard, Discover Card, and Diner's Club, as well Neiman Marcus and Bergdorf Goodman store credit cards. You can also use gift cards for all or part of your order. Horchow have free shipping sections within most of their product categories that list all of the items eligible for free shipping within the United States. Orders excluded from free shipping are charged by the total value, starting at $8 for standard shipping on orders under $50. You can also pay for Two Day and Next Day options, starting at $18 and $25 respectively. Some other terms apply for perishable goods and oversized goods so be sure to check the website for the full breakdown. Returns are accepted within a reasonable amount of time, so long as the items are in their original condition. All orders come with the required return form and prepaid label to make the process easier.